Unlike two years ago there weren't any current NFL coaches taking in the pro day event at UConn but a total of 20 teams were represented. There was nothing earth shattering to report. Getting results from these things is no easy task especially this year when we weren't allowed in to watch the bench press, vertical or broad jumps as we have been in previous years. NFL scouts aren't in the habit of giving results out to the media at these sort of events. The door was cracked open when I got there this morning so I did hear that Mikal Myers had 29 reps at 225 pound in the bench press followed by Matt Walsh topping him with 30. Noel Thomas, who ran in the 4.63/4.64 range in the 40 at the NFL scouting combine believes he easily topped that mark today but I never got a time on his run or anybody else's. "I definitely got a little bit of redemption in the 40-yard dash," Thomas said. "I have never seen a 4.6. I wanted to come out here and get that taste out of my mouth and I don't know the exact time but it definitely wasn't 4.6." Obviously Obi Melifonwu, coming off a jaw-dropping showing at the NFL scouting combine, was the one former Husky the scouts were there to see. He stood on his efforts at the combine (why wouldn't he?) but did both shuttles and the 3-cone drill. His times in the 20 and 60-yard shuttles would rank nearly the top of the defensive back group who did those events at the combine. obi melifonwu unofficial 10.95 unofficial sixty-yard shuttle! "Just like every other level of football, the more you can do, the more valuable you are," Walsh said. "I played a little bit of fullback here my first two years and got some linebacker stuff the last two years. I kind of mixed it up today and whatever a team needs me to be, that is what I am going to be. "My agent is talking to everybody, he is the third party in the middle of everything so I wanted to stay out of it and all I focus on is putting up the best numbers I could, I am pretty happy with everything that happened today." A couple years ago Reuben Frank did what Walsh did today working out on both sides of the ball during pro day. It worked out well for him as he got into NFL and CFL training camps. We'll see if Walsh is as fortunate. Walsh said he could do 17 or 18 reps at 225 pounds on the bench press when he was at Hand High School and his max was 23 while at UConn but his work with Frank Quido at BreakOut Athletes pushed that number to 30. "That was definitely one of my stronger events, all the events you can turn a head on are kind of the most important things," Walsh said. "That was one thing that had to stand out and get the ball rolling and start the day off with a bang." Both Thomas and Andreas Knappe (probably generating the most buzz among the UConn products not named Obi Melifonwu) both had their days cut short due to their hamstrings tightening up when they ran the 40 which is unfortunate. "It is the name of the game," Knappe said. "When you go all out and do whatever you can do, sometimes you get bruised and bumped a little bit so that is what happened. "After I did my 40 so I didn't want to make it any worse so I am calling it a day." Knappe was able to play in the NFL Collegiate Bowl which could prove beneficial moving forward. "The NFLPA Bowl was awesome, it was nice to get to know some scouts and let them get to know you so they know what kind of guy you are," Knappe said. Jhavon Williams is the UConn player who I think should be getting more buzz than he is in the pre-draft process and he said he was pretty happy with his performance today. "You never know," Williams said "A lot of people told me I looked good today, I ran well but you never know. I am working hard and keeping it in God's hands." Bobby Puyol was there to kick some long field goals and he was on target with all of them while also doing some kickoffs. He said he will be taking part in a workout run by the Miami Dolphins on April 7 and has heard from some other teams as well. Garrett Anderson, John Green, Brian Lemelle, Richard Levy and Sean Marinan also took part in today's festivities. Atlanta, Arizona, Baltimore, Carolina, Cleveland, Detroit, Green Bay, Houston, Indianapolis, Jacksonville, Kansas City, Miami, New England (with multiple scouts including Brian Smith who ran the show at both pro days), New Orleans, New York Giants, New York Jets, Oakland, Philadelphia, Pittsburgh and Tampa Bay were teams represented at UConn's pro day. I'm missing three teams but I saw reps from Atlanta, Arizona, Indianapolis, Jacksonville, New England, New York Giants and Philadelphia at the event in Tolland so special kudos to those teams (and others who were there) for going the extra mile. What is interesting is that two of the teams missing today were Minnesota (who had head coach Mike Zimmer at the event two years ago to see Byron Jones) and Dallas (the team which drafted Jones). After the UConn event was over I headed over to Tolland for a regional pro day coordinated by agent Joe Linta. With NFL teams coming to UConn in large numbers and UConn not being receptive to players from other programs taking part in the UConn event, Linta has been holding events the same day in Tolland to check out other prospects. Yale great Tyler Varga and New Haven's Mike Flacco are among clients of Linta's who landed on NFL rosters. Today Linta set the event up to showcase New Haven's All-American offensive tackle Zach Voytek of Trumbull. Voytek measured in at 6-4 1/2 and 313 pounds, ran a 5.37 in the 40, 4.60 in the 20-yard shuttle and 7.90 in the 3-cone drill. All of those numbers would hold up favorably after offensive linemen at the NFL scouting combine. Scouts from 10 teams were there (the Patriots and Giants had two reps each while the scout from the Colts seemed especially chummy with Voytek). 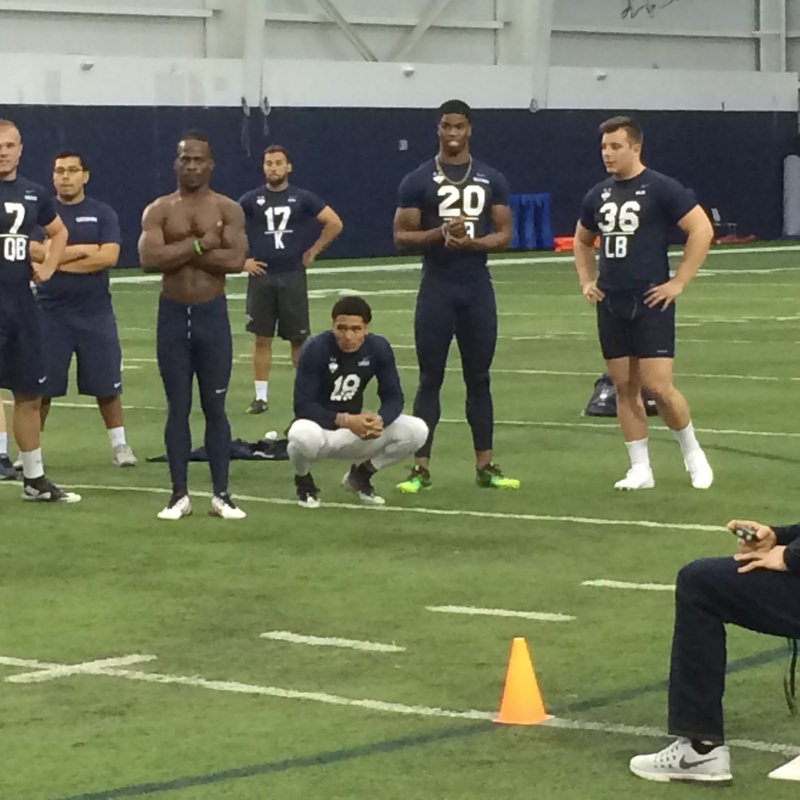 Former Yale running back Dale Harris ran a 4.5 in the 40 and had a vertical jump 35 1/2, Southern Connecticut State receiver Devante Jenkins had a 33-inch vertical and New Haven defensive lineman Dean Tsopanides from Orange had 31 reps in the bench press. Current NFL players Andrew Adams and Geremy Davis were at the UConn event as were Dan Orlovsky (who thinks he could be signed by an NFL team in the next week or two) and Yawin Smallwood. The current UConn team came out for the end of the event. I spoke to Davis and Orlovsky and at some point will get around to sharing stuff from those interviews. UConn will have its second spring practice tomorrow, sorry but after driving to UConn for six straight days and looking at as many as four drives to Bridgeport and back beginning on Friday due to my women's basketball coverage responsibilities, I am taking tomorrow to be UConn free but I believe one of my colleagues will be writing a story off tomorrow's practice.